Teams of students across the state of West Virginia participated in the RockSat-X program this past year through our Space Flight Design Challenge (SFDC) program. The SFDC program is a collaboration between The Hobart and William Smith Colleges in Geneva, New York, and four colleges in West Virginia — West Virginia University, Morgantown; Marshall University, Huntington; West Virginia State University, Institute; West Virginia Wesleyan College, Buckhannon; and NASA’s IV & V Facility in Fairmont. RockSat-X is the most advanced of NASA’s three-phase sounding rocket program for students. The first level is the RockOn workshop, and the intermediate one is the RockSat-C program which launches earlier in the summer. The students traveled to Wallops Flight Facility a week before launch to finalize their experiments and integrate them into the rocket. To read more about the experiments and launch, please go here. 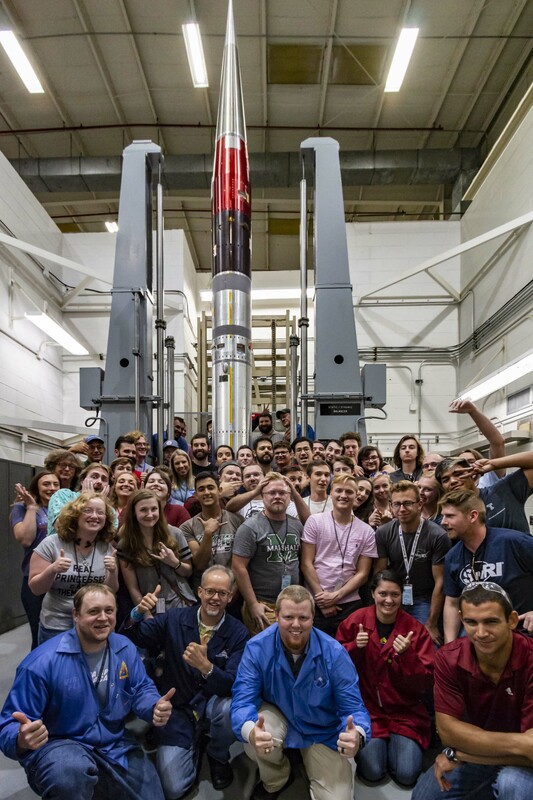 RockSat-X student teams and Wallops sounding rocket personnel pose with the payload on the spin/balance machine. ← STEM Fair in Morgantown, WV!